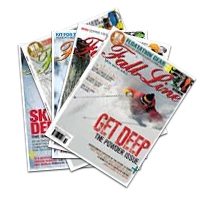 » Telemark Technique Tips » How to Telemark Bumps » November 2013. Let’s cut to the chase - moguls sort the men out from the boys, they magnify your weaknesses revealing what you’re doing wrong. Bumps bruise egos, drive restaurant trade and encourage people to take the lift down at the end of the day, but the best skiers on the mountain are always found in the bumps. If you want to telemark off-piste, you’ll need to learn how to ski bumps. La Grave is full of them, the Grand Montets a moguls Mecca. Learn to tele the bumps and you’ll find yourself at home in tight tricky situations, you’ll feel electric on the piste turning when and where you like and all of a sudden, tree skiing becomes a breeze. The key to telemarking moguls, like any other area of the mountain, is the ability to keep a constant speed. Accelerate too much and you’ll soon be spat out, without enough speed you’ll lose rhythm and timing. To keep your speed constant you’ll need to be able to use all five methods of speed control, checking, use of snow, use of terrain, control of line and skidding. A good telemark skier can apply the correct combination of these in the appropriate place and time to keep their speed constant and telemark in control. The mogul field is full of terrain you can use to help you, the bumps are your friend not your enemy. Use the counter-slope of the upcoming bump to slow you down, let your skis skid up the bank or take a rounded line and use it like a raised corner. Keep your legs soft to help absorb the bump and to keep your skis in contact with the snow. You should let the moguls dictate your path but a good telemark skier can vary his or her line to maintain control. Take a high rounded line if you’ve got space and need to scrape off some speed, or go straight and plough into that huge pile of soft stuff that’s just begging to be smashed. How about getting a touch of air off the next bump and dropping into a different rut line or using a little shimmy if the bumps are irregular. Options are essential in the bumps, controlling your line keeps the options open. If your speed ever starts to run away from you in the bumps then checking is a great way to haul the reins in, if used in the right place and at the right time. Check your skis by applying a sharp increase in pressure and edge while turning the skis quickly. Be careful, if you overcheck you could get spat out or stop altogether, so be measured. Make the most of that pile of soft stuff that has been pushed into the counter-side of the rut, tele into it, send up some spray, let out a grunt, remember people are watching on the chairlift! A solid pole plant is absolutely essential when skiing moguls. Reach downhill while separating your upper and lower body and make a solid pole plant on the top of the upcoming bump. The pole plant will help stabilise your upper body and keep it flowing down the fall-line, while providing a third point of balance to help you pivot around. Once the pole is planted - try to drive the hand forward as you ski past to prevent any over-rotation of the upper body. Last but certainly not least, is skidding. Skidding is your foot brake allowing you to continually make fine adjustments to your speed and line, without skidding fall line bumps would be virtually impossible. Release your edges while turning the skis to get the skis traveling sideways, let them skid down the back side of the bump, up the counter-slope or even around the high bank if you take a rounded line. Skidding is your best friend in the bumps, at any moment of the descent you can use it. Too much edge and you wont stay in that narrow corridor, you’ll accelerate and in the moguls uncontrolled acceleration usually means a big wipe out. We have the Telemark 'How to' Series and the 'Drills for Specific Skills' Series. How to Escape the Intermediate Rut! Sign up for Events, News and Specials...Spam! Seriously? We're too busy Skiing Pow! We don't spam, We're too busy skiing!